MOOCs and Open Educational Resources: A Handbook for Educators is available to university faculty, educators, and educational producers. The guide is a step-by-step manual to how to produce and distribute educational video content under the freest of licenses, with an emphasis on Creative Commons. It is hoped that some utility may be found in its pages by all kinds of readers, whether one is a staff videographer or a chaired senior faculty member or a freelance video editor. The structure of the Handbook follows the key stages of video course production, with analysis and support at its core dedicated to methods of keeping video content free through all the stages of course pre-production, production, post-production, and distribution. 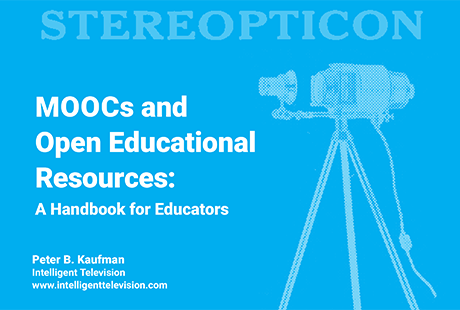 The Handbook also provides some notes on the history of online course production and Open Courseware (OCW) and some thoughts about the future of educational video. The impulse to share knowledge in a free environment also is not new. In many ways MOOCs and Open Courseware and Wikipedia and Creative Commons and Google/YouTube are all part of the same project – envisioned by visionaries such as Richard Stallman, media producers behind the start of public broadcasting here and abroad, much earlier, even, by publishers active centuries ago in the Enlightenment, and even earlier, in ancient Alexandria under the Ptolemaic kings. The vision? A giant rich resource: a gigantic global encyclopedia, or Encyclopédie, or library or museum, contributing to universal access to human knowledge.2 With the Internet upon us now, we can help realize it. 1 Charles Urban, The Cinematograph in Science, Education, and Matters of State (London: The Charles Urban Trading Company, 1907), online at: http://www.charlesurban.com/documents_cinematograph.html and the journal Visual Education (Chicago: Society for Visual Education, 1920-1924). 2 Peter B. Kaufman, The New Enlightenment: The Promise of Film and Video in the Digital Age (New York: Seven Stories Press, forthcoming); “The Encyclopedia of Diderot and d’Alembert,” online in translation at: http://quod.lib.umich.edu/d/did/; and Stephen Greenblatt, The Swerve: How the World Became Modern (New York: W.W. Norton, 2011).